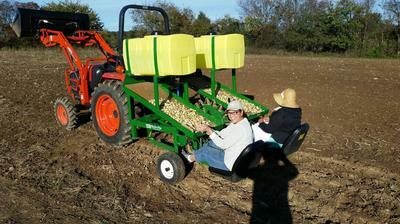 Harvests early summer - stores into mid-winter or longer. Grows very well in warm winter areas. lnchelium Red is a large and beautiful artichoke garlic with delightfully robust flavor but not so strong as to be overpowering. In 1990 Rodale Kitchens, part of the parent organization of Organic Gardening magazine, sponsored a garlic tasting contest. Inchelium Red won the contest. The verdict was not unanimous, of course, as people's tastes vary widely, but it won anyway. It is among our best selling artichoke garlics most years. 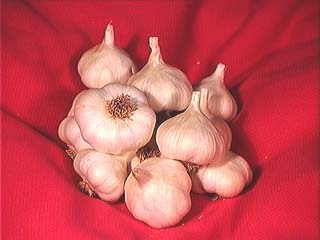 Inchelium Red is my benchmark garlic for true medium. 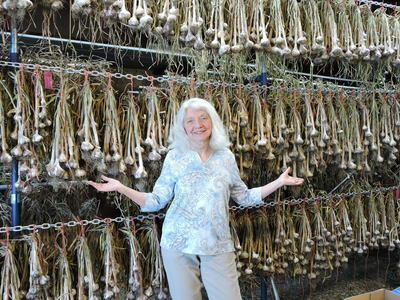 I compare the tastes of all garlics as being milder or stronger than Inchelium Red. It has medium rich garlickness and medium pungency, or, hotness when eaten raw. On a scale of 1 to 10 on flavor and taste, it gets a 5 in each category. From a growers perspective, it is a large and healthy garlic to grow and appears to be relatively resistant to most of the diseases that can affect garlic. Its true origin is unknown as it was discovered growing on an Indian reservation and no one seems to know where it came from. Inchelium Red usually has anywhere from 10 to 12 very large cloves and even the interior cloves are generally of good size. There are none of the tiny inner cloves that many softnecks have. The outer bulb wrappers are thick and protect the bulb well so it is a good storing garlic but still peels easily. 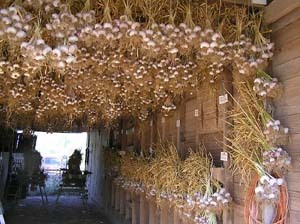 For those who want to grow their own garlic it has enough cloves that it doesn't take but a year or two to grow all you can eat. It harvests in mid-season (late for an artichoke) and takes a little longer than average to cure due to its large size. Bulbs are usually over 2 and a half inches in diameter and will weigh several ounces each.